For many years time Gottfried Heinrich Stölzel was reputed to be the probable composer of the song 'Bist du bei mir' which Johann Sebastian Bach included in his 'Notenbüchlein für Anna Magdalena Bach'. Very few of his other compositions were known. He was held in high esteem: the theorist Johann Mattheson ranked him among the "learned and great masters" of his time. In 1739 he was elected a member of Lorenz Christoph Mizler's Societät der Musikalischen Wissenschaften. Mizler even placed him above Bach in his list of leading German composers. The two compositions on this disc belong to the genre of the 'serenata', which is, generally speaking, a composition written in honour of a royal or aristocratic person. We know many pieces of this kind, written by the likes of Johann Sebastian Bach, Henry Purcell and Alessandro Scarlatti. The subject matter and the musical style can vary strongly. Sometimes the subject is mythological, and has no direct connection to the person for whom the serenata was written. But there are also many in which he or she is specifically praised and his or her positive character traits are hymned at great length. These two works represent the two kinds of serenata. The reason why were written and details of when they were performed is not known exactly. 'Seid willkommen, schöne Stunden' is assumed to be written for a name day or a birthday of Duke Friedrich II of Sachsen-Gotha. At his court Stölzel was Kapellmeister from 1720 until his death. According to a contemporary source he must have written a large amount of music, including many occasional pieces but most of them have been lost. In fact, this particular piece is the only occasional surviving work written for the court of Sachsen-Gotha. It is partly due to Stölzel's successor as Kapellmeister, Georg Benda, that so many of his compositions are lost. The longest piece in this recording, 'Alles, was sonst lieblich heißet', was very likely performed at the birthday of Prince Günther I of Schwarzburg-Sondershausen in August 1736. Stölzel was closely connected to this court. In 1715 he had applied for the position of Kapellmeister, but Günther's father had elected Johann Balthasar Freislich instead, much to the dismay of most members of the court chapel. In 1720, the very same year Stölzel began his duties in Sachsen-Gotha, Günther I succeeded his father. Being an intellectual and a great lover of music and the arts, he very much regretted the fact that Stölzel was not available to act as Kapellmeister. In order to take profit of Stölzel's great talent he asked him to write sacred and secular music for the court. In fact Stölzel acted as a kind of 'shadow Kapellmeister'. It is largely thanks to the care with which his music was treated in Schwarzburg-Sondershausen that a considerable part of Stölzel's musical output has come down to us. Stölzel often wrote the texts for his sacred and secular compositions. In his autobiography, included in Johann Mattheson's 'Grundlage einer Ehren-Pforte', he embraced the principle that "the poetic profession is at all times linked" to the "proper exercise of the musical profession". For him poetry and musical composition were part of the same creative process. Whether he is also the author of the two serenatas in this recording cannot be established, but it is quite possible. The shortest piece is an example of a pastoral, in German a 'Schäferspiel'. It is about Amoene (soprano) and Philander (alto) who love each other, and Myrtillo (bass) who tries to win Amoene's heart. Strephan (tenor) then comes to their rescue and makes Myrtillo see the errors of his ways and recognize that Amoene and Philander are meant for each other. The name of the addressee of this piece is nowhere mentioned. It is evidence of Stölzel's originality that this serenata does not end with a chorus. After a short duet of the two lovers Myrtillo sings a recitative in which he expresses his regret and wishes them well. The work closes with an instrumental movement, a gigue scored for the full orchestra, including trumpets and timpani. The first disc is entirely devoted to 'Alles, was sonst lieblich heißet'. This is a serenata of the kind one could call 'laudatory'. After a Sinfonia for the full orchestra, which includes a pair of trumpets, the four singers are representing themselves, as it were, claiming that they are the most important of all voices. The soprano begins by saying there is no match for her, as "in tenderness and height I go far above all voices", but the others disagree. The bass states the soprano would be nothing without his foundation and support. This dialogue between the voices takes place through recitatives and arias, and concludes with the soprano, saying: "this dispute is itself the origin of sweet unity: if your delightful song had no difference in high and low, where would it be, the euphony drawing heart and ears to it?" The voices then sing duets, the soprano with the tenor and the alto with the bass, as to demonstrate that "no consonance can arise unless sundered voices are wed". But this dialogue then turns out to be the prelude to a eulogy on the virtues of Prince Günther, as "the sweetest strains of the most delightful tunes don't approach Virtue's melodious sound". The soprano's recitative says it all: "O most highly perfect Harmony that is found here. Most Serene Highness, your noble life unites the beloved choir of virtues in the most beautiful harmony and sings its wonderfully beautiful melody to the world. Therefore, for this reason, universal glory remains yours". The soprano then declares her supremacy again, as she represents piety as the highest virtue, and the pious Prince's heart "steers toward every height and thinks of the heavenly more than of the earthly". The alto, tenor and bass also represent the virtues of Prince Günther, the latter praising him as "the foundation stone", on which his well-being will ever increase. As I have already mentioned serenatas of this type were written in profusion during the baroque era. It is testimony to the creativity of their composers that so many of them are of excellent quality, despite their often bootlicking texts. The overall quality of the text of this piece is above average, and if it was indeed written by Stölzel himself it shows that he was a skilled poet as well. To this text Stölzel has written excellent music. The arias are well written for the voices. Stölzel is not one to miss opportunities for word-painting and there is a lot of variety in the instrumentation. In one of her arias the soprano says that Philomela sings to her glory. Both the violins and the singer then imitate the singing of a bird. Descending figures dominate the aria of the bass in which he states that music couldn't prevail without his foundation - the parallel is that sky would be in danger of falling without the support of Atlas. When the soprano sings the glory of the Prince, a trumpet is heard - the instrument traditionally associated with royalty and nobility. Very beautiful is the alto aria in which "your grace's bright light" is compared with the sun's "light and bliss after the dark and dreary night". The instruments play colla parte with the voice, producing a magical effect, and this aria - unlike the others without a dacapo section – concludes with a short solo of the flute. In comparison the pastoral is simpler - in accordance with the convention. The arias are less demanding, there is less variation in instrumentation and there is less opportunity for word-painting. But this relative simplicity has its charm too, especially as Stölzel has written some fine music. The alto aria in which Philander reminds Amoene of their love is particularly delightful because of the obbligato part for the flute. Over the last years I have heard a number of recordings with vocal music by Stölzel. 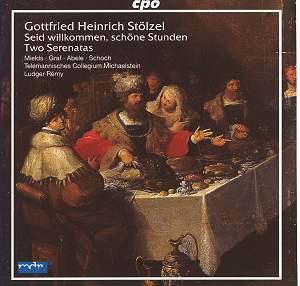 The more of his music I hear the more I am convinced Stölzel belongs to the very best composers of the German baroque. I rate him as high as Bach, Telemann, Graupner and Fasch. It is a great shame so many of his works have disappeared, in particular his dramatic works. But we should be thankful for what has survived, and for the fact that some musicians are willing to explore his music and perform and record it. The most prominent among them is Ludger Rémy, who is responsible for most recent recordings of Stölzel's music. He has always been able to attract first-rate singers and players to make sure Stölzel's works receive the best possible interpretations. This set is no exception. All four singers give splendid performances, in particular in the arias. They capture their character very well, and the blending of the voices with the instruments is immaculate. I would have liked them to sing the recitatives with a little more rhythmic freedom, though. The instrumental ensemble is colourful and the effects Stölzel makes use of are realised very well. The individual members of the ensemble show great skill in the obbligato parts of the arias. This recording of serenatas by Stölzel is a winner in every respect. One should be very grateful to Ludger Rémy for bringing this music to the attention of today's audiences. I hope he will continue to explore Stölzel's oeuvre which surely contains many more treasures.